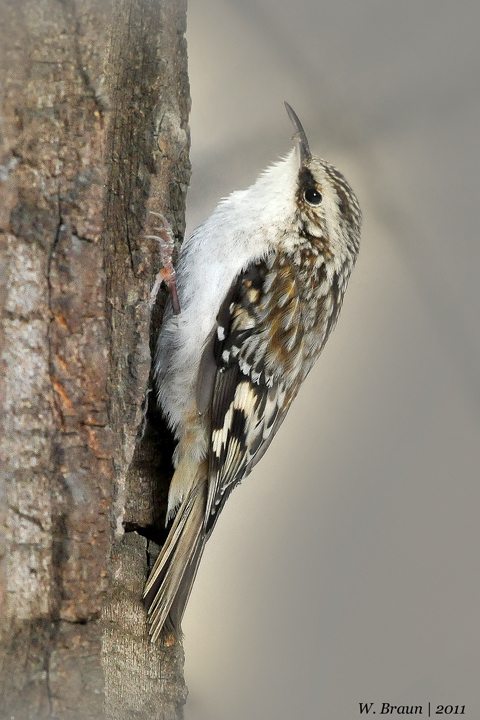 The Brown Creeper (Certhia americana) is the only North American species of the Creeper family. It gets its name from its distinctive behaviour. It creep up tree trunks, starting at the base of a tree, then spiraling upward around the trunk until it nears the top.Then it repeats its upward spiral creep either on the same tree or a different one. Not a vegetarian by preference, it forages for a variety of insects and larvae, spiders and their eggs, and ants in the tree bark. It prefers mature, unlogged coniferous forests and mixed coniferous-deciduous forests. I have only seen it on trunks of large trees. It is difficult to spot this small, well-disguised bird, but recently it has appeared now and then in my backyard. Last seen yesterday, January 12, 2011.